Home Unlabelled Two people shot and injured as thugs rob M-PESA shops. Two people shot and injured as thugs rob M-PESA shops. 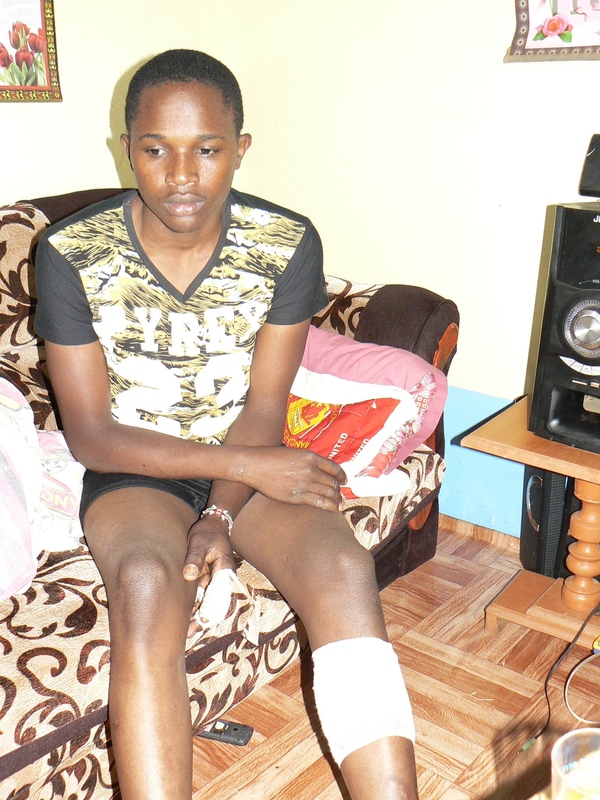 George Maina, a victim of the robbery nursing an injured leg after the robbery in Witeithie Estate on Saturday night..
Armed robbers yesterday evening shot and critically injured two people in a robbery at Witeithie Estate of Juja Sub-County. The thugs were forced to open fire after they were accosted by irate members of public who were responding to distress calls from the victims. It is alleged that the robbers, who were armed with an AK 47 rifle assault rifle and two pistols raided two M-PESA shops at around 8pm on Saturday, making way with unspecified amount of money. When the victims raised alarm, members of the public confronted the criminals and started throwing stones at them, prompting them to open fire. The deafening and thunderous sounds of gunshots led to the mob run helter-skelter scampering for dear life upon, giving room to the gang to majestically leave the scene. In the ensuing confrontation, two people were shot and injured, one getting injured on the shoulder while the other was shot on the leg. George Maina, 23 was caught by the bullet as he was heading home, unawares of what was happening. He was rushed to Thika Level 5 Hospital by a Good Samaritan. The bullet penetrated from one side of his leg and exited from the other, missing his bone by a whisker. Officers from Witeithie AP Camp led by Sgt. Tirus Murimi arrived after some time but their attempts to pursue the criminals were fruitless. Concerned residents have decried the sorry state of insecurity in the area, calling for a major crackdown by security agencies to flush out criminals in their midst. Cases of armed robberies, especially those targeting M-PESA operators, have been the norm in Witeithie Estate in the recent past. The area has turned out to be a safe haven for both hardened criminals and petty thieves. Area MP Francis Waititu Munyua alias Wakapee expressed concern over the skyrocketing insecurity in Juja Sub-County and especially Witeithie, Theta, Juja and Murera areas. He urged members of the public to report suspicious criminals in their midst. Area Chief Mucui Muiruri appealed to residents to promote community policing. He said tenants should know the people they were living with.